The US Equities markets rotated over 1.35% lower on Monday, June 25, after a very eventful weekend full of news and global political concerns. Much of this fear results from unknowns resulting from Europe, Asia, China, Mexico and the US. Currently, there are so many “contagion factors” at play, we don’t know how all of it will eventually play out in the long run. Europe is in the midst of a moderate political revolt regarding refugee/immigration issues/costs and political turmoil originating from the European Union leadership. How they resolve these issues will likely be counter to the populist demands from the people of Europe. Asia is in the midst of a political and economic cycle rotation. Malaysia has recently elected Prime Minister Dr. Mahathir Mohamad, the 92-year-old previous prime minister (1981~2003) as a populist revolt against the Najib Razak administration. In the process, Mahathir has opened new and old corruption and legal issues while attempting to clean up the corruption and nepotism that has run rampant in Malaysia. Most recently, Mahathir has begun to question the established relationship with Singapore and the high-speed rail system that was proposed to link the two countries. China is experiencing a host of issues at the moment. Trade concerns, capital market concerns, corporate debt concerns and an overall economic downturn cycle that started near the beginning of 2018. What will it take to push China over the edge in terms of a credit/consumer market crash is anyone’s guess? Our assumption is that continued inward and outward pressures will not abate quickly – so more unknowns exist. Mexico will have new Presidential elections on July 1, 2018. What hangs in the balance of this election cycle is just about everything in terms of North American economic cooperation and future success. It is being reported that a populist “anti-neoliberal” movement is well underway in Mexico and the newly elected leader may begin a broader pushback against President Trump regarding NAFTA, immigration, US corporations operating in Mexico and more. We won’t know the full outcome of this election till well after July 2018. Meanwhile, back in the USA, our political leaders in Congress and the House of Representatives seem hell-bent on opposing everything President Trump and many American’s seem to want – clean up the mess in our government and get a handle on the pressing issues before us. The US has a growing and robust economy. The last thing anyone wants right now is anything to disrupt this growth. Yet, it seems the political divide in the US is so strong that it may take some crisis event to push any resolution forward. What does this mean for investors and traders? Fear typically appears in one place before it appears anywhere else – the Metals markets (Gold, Silver, Platinum, and Palladium). 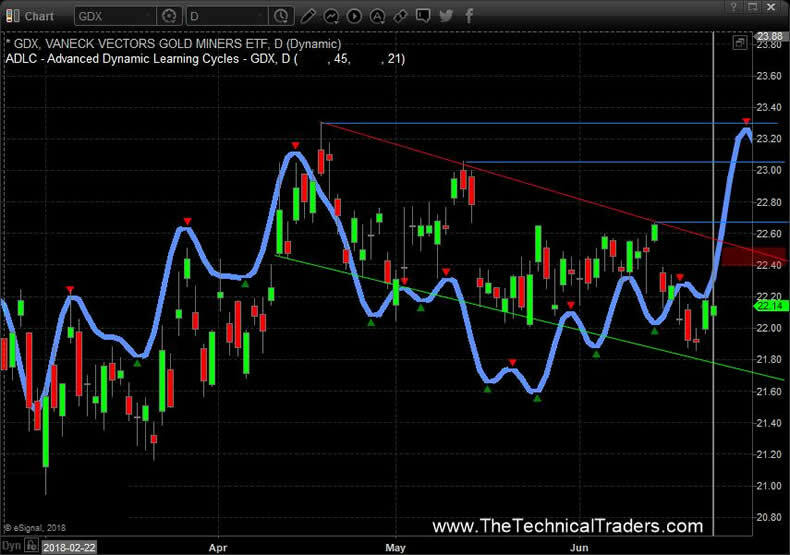 This Daily Gold Chart shows our predictive cycle analysis pointing to a near-term bottom formation as well as a strong likelihood of immediate upside price action. These cycles do not represent price levels. 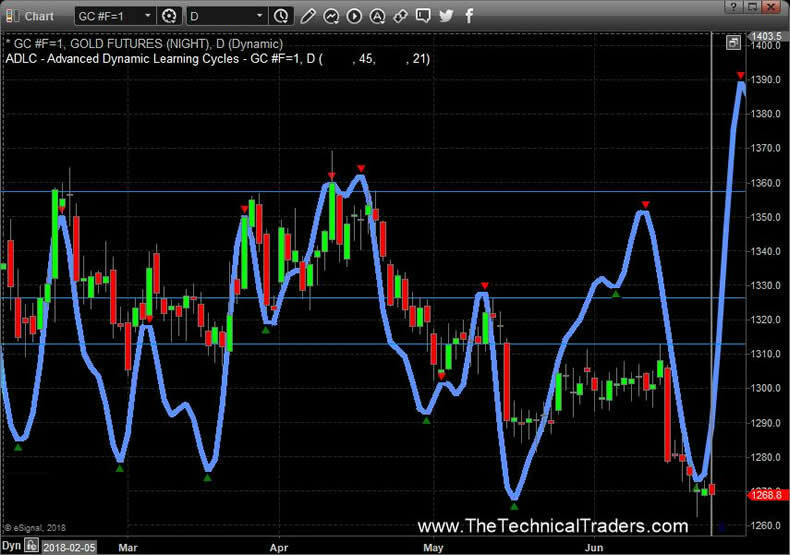 So the cycle peak does not represent where price will go – it simply indicates future cycle trends and direction. Given this information, it is very likely that Gold will recover to near 1320 within the next couple weeks and possibly push higher on global concerns. For traders, this means we are sitting near an ultimate bottom in the metals and this could be an excellent buying opportunity. The Gold Miners ETF shows a similar cycle pattern but notice how prices in the Miners ETF have diverged from the Gold chart, above, by not resorting to a new price low as deep as seen above. This could be interpreted as the Gold market reacting to global concerns in an exaggerated way while the miners ETF is showing a more muted reaction. Additionally, notice how the ADL cycle analysis is pointing to similar price peaks in the future with near-term bottoms forming. This is key to understanding what we should be expecting over the next few weeks in Gold. Our interpretation is that the global fear will manifest as a renewed upside trend in Gold and Gold Miners over the next few weeks with the potential for a 5~8% rally in Gold. The long-term upside is incredible for these trades but that is if you look years into the future. As these fear components and unknowns continue to evolve, the metals markets should find support and push higher as fear continues to manifest and global markets continue to weaken. As we have been stating since the beginning of this year, 2018 is setting up to be a trader’s dream. Bigger volatility. Bigger swings. Bigger profits if you are on the right side of these moves. Our proprietary predictive modeling systems and price analysis tools help us to stay ahead of the markets. We help our members understand the risks and navigate the future trends by issuing research posts, providing Daily video analysis complete with cycle projections and by delivering clear trading signals that assist all of our members in finding profits each year. We are showing you one of our proprietary tools right now, our ADL Predictive Cycle tool and what we believe will be the start of a potential upside move in the metals markets. Get ready for some great trading over the next few months! Get These Cycles for Oil, Gold, Bonds, SP500 and More.